Saying Rosie and Rudy were eager to taste test Buddy's Kitchen Dog Treatz would be an understatement. Once I pulled one out of the bag, I knew why. They smell fantastic! 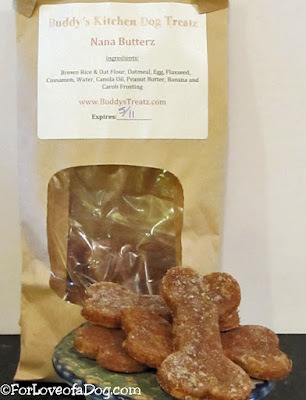 Buddy's Kitchen offered to send us a package of their dog treats in exchange for our honest opinion We received a package of 8 of their Nana Butterz. . Retail price $10.99 for 1 dozen on their website. You can order Nana Butterz in several quantities and have choices of toppings. 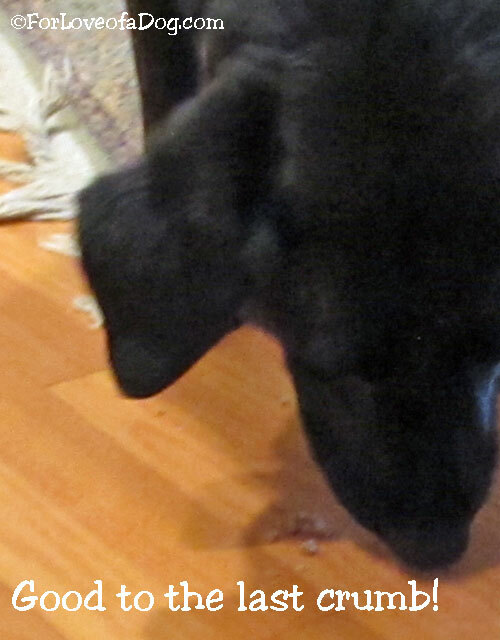 These dog treats come in ziplock bags inside a self-sealing paper bag for freshness. Carob - (Substitute for Chocolate) Carob is nutritious – with vitamins (A, B1, B2, B3, E) and minerals (e.g. calcium, iron, potassium, magnesium, phosphorus). The vitamin E in carob supports the skin since vitamin E has anti-viral and anti-bacterial properties. Buddy's Kitchen offers lots of other yummy treats including Apple Cinnamon Bitez, Breath Fresherz, Pupcakez and many grain free selections. 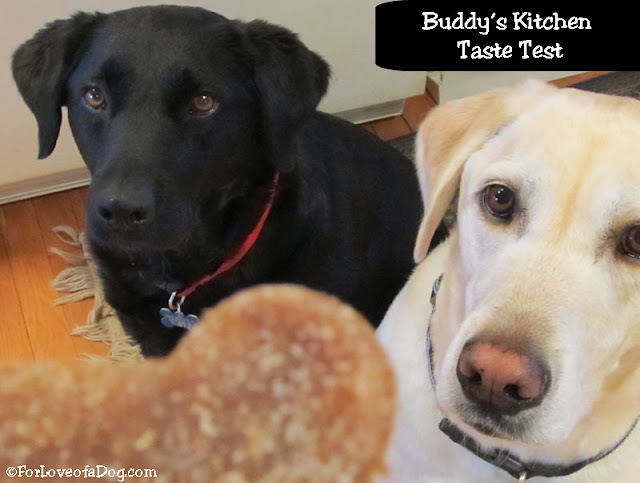 Rudy can tell by the smell that Buddy's Kitchen dog treats are good! I love that they're make with natural, human grade ingredients and are easily digested. 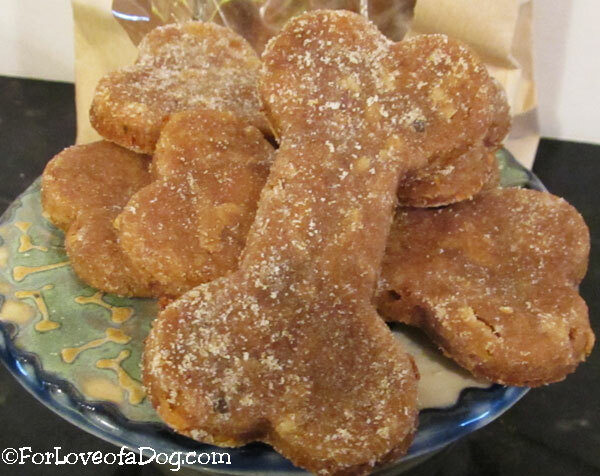 Their base flour included in each treat is Organic Brown Rice and Oat flour which are naturally gluten-free. These types of flours are simple and provide better enrichment than many other types flour. Plus, they now offer a GRAIN FREE option using Coconut Flour. Other main ingredients include but are not limited to: Oatmeal, Flaxseed, Cinnamon, Canola Oil and Water. No dyes, no additives, no preservatives. No corn, no wheat, no soy. 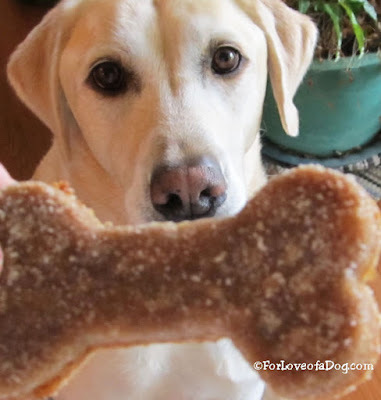 We also love that Buddy's Kitchen has teamed up with Deaf Dog Rescue of America. 50% of every sale will be donated to this wonderful organization to help care for all dogs from food to vet bills. Rosie just can't hold her licker! 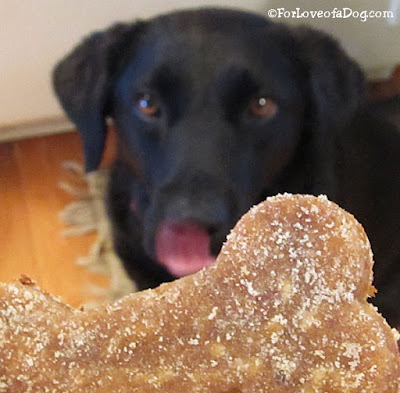 Shop for healthy Buddy's Kitchen dog treats here and follow them on their facebook page. Rosie and Rudy love these tasty dog cookies and we're sure your dogs will, too! * We received one package of 8 dog treats from Buddy's Kitchen in exchange for our honest opinion. I love Rosie's intensity. She is focused. They look just like homemade cookies. Yum! Those look and sound way yummy.